EXECUTIVE SUMMARY: Seventy-six years after the mass massacre of the Baghdad Jews, in which the then-leader of the Palestinian Arabs, Hajj Amin Husseini, was deeply involved, his heirs to the Palestinian leadership still sustain an anti-Israel and anti-Jewish campaign of racial and political incitement unparalleled in scope and intensity since Nazi Germany. On the Jewish holiday of Shavuot, June 1-2, 1941 (5701 on the Hebrew calendar), the Muslim residents of Baghdad carried out a savage pogrom against their Jewish compatriots. In this pogrom, known by its Arabic name al-Farhoud, about 200 Jews were murdered and thousands wounded. Jewish property was plundered and many homes set ablaze. Within a week, the British ousted the pro-Nazi government of General Rashid Ali, which had seized power in a coup d’état two months earlier, and restored the legal Iraqi government. That government appointed a commission of inquiry into the pogrom, which determined that the Nazi propaganda of Radio Berlin had been one of the massacre’s foremost instigators. The commission’s report also identified the main individuals who had impelled the assault. 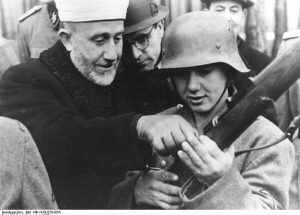 It pointed to the extensive activity of Dr. Fritz Grobba, the German ambassador to Baghdad, and to the activity of the former mufti of Jerusalem, Hajj Amin Husseini, who had fled to Iraq from Mandatory Palestine in October 1939 (after a short spell in Beirut) and begun inciting against the Iraqi Jews. The mufti had also worked with Iraqi subversive elements, including Rashid Ali, to overthrow Iraq’s ruling Hashemite monarchy and install a pro-Nazi regime. In an attempt to win Arab and Muslim hearts and minds, the first Arab-language Nazi radio station was launched in Berlin prior to the outbreak of the Second World War, broadcasting anti-British, anti-American, anti-Soviet, and particularly anti-Semitic propaganda. It thus helped spread radical anti-Semitism in the Middle East, where it found common ground with the anti-Jewish tendencies in Islam. The messages in the propaganda broadcasts were designed to achieve certain goals, such as winning the Arab population’s sympathy for the Nazis and the Führer; inciting against the British and French presence in the Middle East; stoking Arab national sentiments; and, last but not least, wildly inciting against the Jews, who were accused inter alia of stealing the Arabs’ money and being behind all the Arab world’s woes. In broadcasts after the pogrom, Bahri justified the massacre and accused the Iraqi Jews of obtaining and disseminating propaganda material from the British embassy in Baghdad. He also charged them with providing the British embassy with military information about the Iraqi army. With such malicious fabrications he lent legitimacy to the Farhoud massacre. Hajj Amin had been deeply implicated in the widespread massacre of Jews in Mandatory Palestine – from the April 1920 Jerusalem pogrom, for which he was sentenced to 10 years in prison by a British military court but managed to flee the country, to the 1929 riots in which 133 Jews were murdered and hundreds injured, to the 1936-39 “revolt” in which hundreds of Jews were murdered. Against this backdrop, it was only natural for him to play a central role in the Farhoud, both in inciting the local Iraqi population against their Jewish compatriots and through his close involvement with the Rashid Ali regime. The fifth column played a large role in the failure that the movement [the Rashid Ali regime] suffered in Iraq. This column consisted of different elements, of which the main one was Iraqi Jewry…. During the war, Jews who were employed in the telephone service would record the important and official conversations on reels and pass them to the British embassy in Baghdad. The Jews in the postal and telegraphic authority did the same. They hurriedly sent the embassy the telegrams and letters that reached them. Regrettably, seventy-six years after the Farhoud, it appears that the mufti’s heirs to the Palestinian leadership have learned nothing and forgotten nothing. When Mahmoud Abbas stood beside President Trump on the White House lawn and declared to one and all that the Palestinians educate their children for peaceful coexistence with Israel, not a muscle twitched in his face. In fact, during its 20-year-long control of the Palestinian population of the West Bank and Gaza as part of the Oslo “peace” process, Abbas’s Palestinian Authority, not to mention Hamas, has subjected its subjects to a relentless hate campaign of racial and political incitement unparalleled in scope and intensity since Nazi Germany. That campaign not only delegitimizes the idea of Jewish statehood but also propagates the murder of Jews simply for being Jews. And if history teaches us anything, it is that the translation of such words into action is all too easy. Dr. Edy Cohen is author of the book The Holocaust in the Eyes of Mahmoud Abbas (Hebrew).